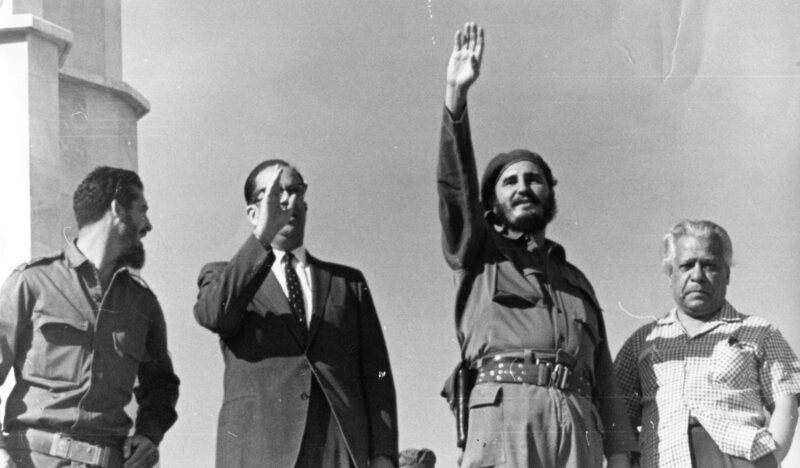 Fidel Castro assumes power after ousting the Batista Government in 1959. In response to the critiques of Wayne Price and Liam Swenson to my piece on anarchism in The Platypus Review #65,1 I will reiterate what I consider the major differences between Marxist revolutionary theory and anarchism in general. I say in general because I see nothing to be gained by dealing with the great variety of differences within anarchism itself presented by these critiques. In fact their great variety proves the very fleeting and vacillating nature of the anarchist project. The major difference with regard to revolutionary theory revolves around the anarchist interpretation of the two great revolutions of the twentieth century—the Russian and the Chinese. To the anarchist respondents, these revolutions were not revolutions at all since they simply substituted one kind of tyranny for another one. In fact, Price explicitly describes the Soviet regime as state capitalist from its very beginning. Moreover, the reasons given for this state of affairs is supposed to have resulted from the existence of a vanguard Leninist party as the leadership of these transformations. The very idea of such a party is anathema to the anarchist tradition and my critics are in easy agreement with this tradition. Finally, they also categorically reject the ideas articulated by Marx and Engels in their discussion of the Paris Commune, reiterated in Lenin’s State and Revolution, that after a socialist insurrection takes power it must first abolish capitalist state power and initiate a new form of state power—a dictatorship of the working class necessary for the whole transitional period leading to a classless and stateless future. Since all this has been more or less implemented by all 20th century revolutions, one might think that our critics might have something to say about the actual history of these revolutions, whether they did anything progressive, what mistakes were made, why they were aborted, etc. The one remaining socialist society, Cuba, is the exception that proves the rule. The Cuban insurrection took power without a party and almost immediately formed one with the pre-existing communist party. The successes of the Cuban revolution are clearly defined by the terms mentioned above and can easily be appreciated by anyone who has visited that embattled island (we Canadians have vacationed there by the thousands and even the most depoliticized of us realize that something very special and positive has been happening there.). Of course, it is possible that Cuba could turn revisionist since, as said before, these kind of societies are transitional and can go backwards as well as forwards. Are anarchists in their superior wisdom really prepared to declare that Cuba is a wretched place ruled by a Leninist tyranny? There are real questions to be asked about contemporary revolutions, about how socialist they were since they all took place in backward, feudal conditions surrounded by hostile, more powerful capitalist nations where so many of their policies like land reform and building of a state administration (yes, I said “state”) had to be done with little experience or trained personnel. However, anarchists are so certain that these revolutions were doomed from the beginning for not living up to some still unfulfilled anarchist ideal of an explosive leap into the future that they are categorically rejected, their histories are wiped out and only anarchism is left to save us from blind authoritarianism. What seems so striking politically is how well these anarchist positions dovetail with all conventional bourgeois opinion from Left to right. The left social democrat would condemn these revolutions because they happened in the wrong place at the wrong time, while liberals and conservatives would say that they were tyrannies because they did not implement a bourgeois electoral process. But all would agree with anarchists in their unquestioned rejection of the communist menace. These differences between anarchism and revolutionary Marxism are so fundamental that I really have little else to say. At the level of history and theory we have been discussing, we simply disagree lock, stock, and barrel. After saying this, I don’t at all mean to suggest that it is impossible for Marxists and anarchists to unite in meeting some of the major issues of our time. It is often not general theory that determines actions necessary in specific contexts. The Bolsheviks, for example, allied with the left socialist revolutionaries (anarchists) right after the insurrection. In the contemporary context, such tactical alliances appear even more salient. I must admit that alliances with Platypus writers and its audience appear difficult because Platypus has little proclivity to activism. Consolidated intellectual anarchists like my respondents may be an even more difficult matter because, while Marxism at its best is quite open to criticism about historical problems and tactical differences, convinced anarchists tend to be quite dogmatic in positioning themselves beyond Marxism. Whenever I descend into cynicism, whenever I despair and waver in my anarchist principles, I need only visit a Marxist site like this one to have my revolutionary convictions restored. Why would, I have to ask myself, or better yet, how can anybody with a real interest in the social revolution publish anything as oafishly stupid as the above? It is a testament to anarchism that its critics are so enfeebled by their efforts to contravene. The unfortunate author begins by stating that its great variety of tendencies proves (Yes, proves!) how fleeting and vacillating the anarchist project is. Firstly, somebody at Platypus might take pity on poor Gamberg and buy him a dictionary as he obviously cannot distinguish between variation and vacillation. And some charitable soul might also tutor him in critical thinking and English composition as it perhaps not productive to begin a critique of anarchism from a Marxist point of view by stating that the former is fleeting when in fact it is older than the latter. Indeed, the fact that he is undertaking such a critique undermines his charge. The differences in theory does not revolve around the outcomes of revolutions. This puts the cart before the horse. Anarchist critique of Marxism and its inherent dialectical contradictions predate (and are confirmed by) the two events he cites. Indeed they did, I trust Gamberg is just summarizing here and not so foolish as to dispute it. Lenin began shutting down soviets in which the Bolsheviks did not have a majority immediately upon seizing power. He shut down the postal soviets within 24 hours of his putsch. And he didn’t stop until all vestiges of worker power were eliminated. Price is right. Astonishing! Does Gamberg know anything about Leninist theory or Russian history? Yes a vanguard Leninist party did seize power–it was headed by none other than Lenin himself, the father of vanguardism. He ruthlessly eliminated all rivals to Bolshevik power, Right and Left, by means of state terror, all the while justifying these abominations by citing Marx and Engels and his own interpretation of their ideas. Is Gamberg denying this? Does not the creator of the Cheka, the NEP, the prison camps, the show trials (Menshivik and SRs etc) bear any responsibility? Is not the man who crushed the independent trade unions, the factory committees, the workers’ plenipotentiaries and the Kronstadt Rebellion responsible for the development of state capitalism in Russia? Gamberg is insane. First, anarchists have lots to say about these Marxist revolutions, as he himself notes above. Second, where has any Marxist revolution led to a dictatorship of the working class? Answer: nowhere. Every Marxist-led revolution has occasioned the rule of a bureaucratic class which perpetuated itself by extracting value from the labor of workers. None can be characterized as a dictatorship of the proletariat. Third, we do not grant the special status attributed by Marxists to the proletariat. Anarchists, myself included, see the social revolution as requiring the equality of all the productive classes, not the rule of industrial workers. Indeed it is this part of Marx’ theory which is most suspect, and has been sufficiently debunked by the actual course of historical events. In any case, Gamberg cannot hold anarchists to Marxist theory. It’s your erroneous theory, you are stuck with it, not us. I could go on but why bother. I ask the editors at Platypus what is the point of posting such nonsense as this? Perhaps we would benefit from a real discussion of the pros and cons of anarchist and Marxist theory, but what is gained by your publishing such ill-conceived, facile, low-brow drivel? It’s the worst sort of Left sectarianism as it is opprobrious without being of any analytical value whatsoever. I hope that someday the people at Platypus will become more interested in socialism than in debating Marxist theory. If and when you do, I believe you will find strength in numbers. The Left is in a pitiable state, let’s find a way forward.